Kenmore dryer error codes are shown on the dryers display to help you to troubleshoot the problem with your dryer. The error codes below will help you to identify what is wrong with your Kenmore Elite dryer. Once you have identified the error code, this code will tell you which part is causing the error code. You can then check the part and repair or replace that part when needed. Kenmore dryer help videos are here. Kenmore Elite dryer manuals are here. Check or Repair Needed = Power failure while the dryer was in cycle. Press the Stop button to clear the display. If you experience common power failures on your dryer be sure to check the electrical outlet cord. Check or Repair Needed = Remove the dryer from power for 10 minutes. Apply power back to the dryer and if the code returns you need to replace the main electronic control board. Check or Repair Needed = A button on the keypad may be stuck on one of the user interface controls. If the button cannot be unstuck then replace the user interface control assembly. Check or Repair Needed = The heater relay on the main electronic control board has failed. Remove power to the dryer and replace the main electronic control board. Check or Repair Needed = The controller indicates an electrically open outlet temperature sensor (thermistor). Remove power from the dryer. Use a multi-meter and check the resistance of that particular thermistor/temp sensor (10,000 ohms). If the outlet temperature sensor is bad then replace it. Check or Repair Needed = The controller indicates an electrically open inlet temperature sensor (thermistor). Remove power from the dryer. Use a multi-meter and check the resistance of that particular thermistor/temp sensor (50,000 ohms). If the inlet temperature sensor is bad then replace it. NOTE: The inlet thermistor is part of the high limit thermostat on this dryer. Check or Repair Needed = The controller indicates an electrical shorted inlet temperature sensor (thermistor). Remove power from the dryer. Use a multi-meter and check the resistance of that particular thermistor/temp sensor (50,000 ohms). If the inlet temperature sensor is bad then replace it. Check or Repair Needed = Remove power from the dryer. Check the wiring harness on the moisture sensor visually and with a multi-meter. If the wiring connections are okay then replace the moisture sensor. Check or Repair Needed = Check the lint screen filter and clean of any lint. Remove fabric softener buildup on the lint screen if necessary. Clear lint blockage restriction from the air vent exhaust system. Check or Repair Needed = The L2 leg of the 240 volt power is below 30 volts. Check circuit breakers for the dryer and reset the L2 breaker if needed. Remove power to the dryer then check the power cord wire connections on the terminal. If any loose wires are found resecure them. Replace the power cord if it has become damaged. Check the 240 volt power supply to the dryer. Check or Repair Needed = Remove power from the dryer. Check the wire harnesses visually and with a multi-meter from the electronic control board and the user interface control board. If the connections are okay then the main electronic control board and the user interface control assemblies may need to be replaced. Check or Repair Needed = Remove power from the dryer. Check the wire harness connections between the user interface assemblies visually and with a multi-meter. Check the wire harness connections between the main electronic control board and the user interface assemblies visually and with a multi-meter. If the wiring connections are okay then one or both of the user interface control assemblies may need to be replaced. 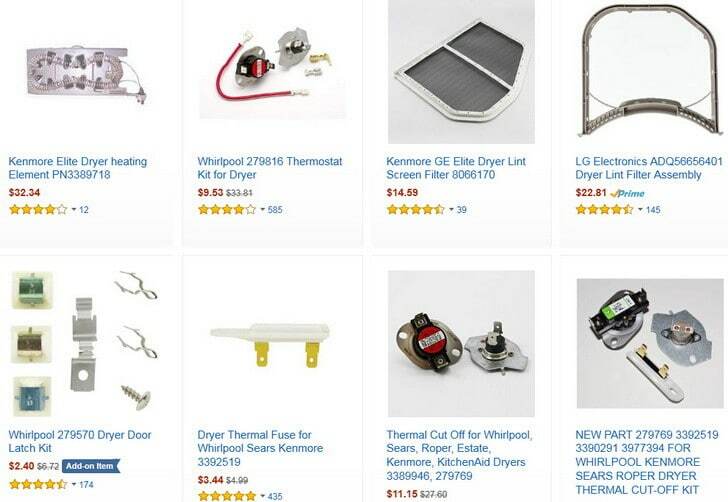 More clothes dryer troubleshooting for Frigidaire Dryer Error Codes, GE Dryer Error Codes, Kenmore Dryer Error Codes, LG Dryer Error Codes, Maytag Dryer Error Codes, Samsung Dryer Error Codes, and Whirlpool Dryer Error Codes. 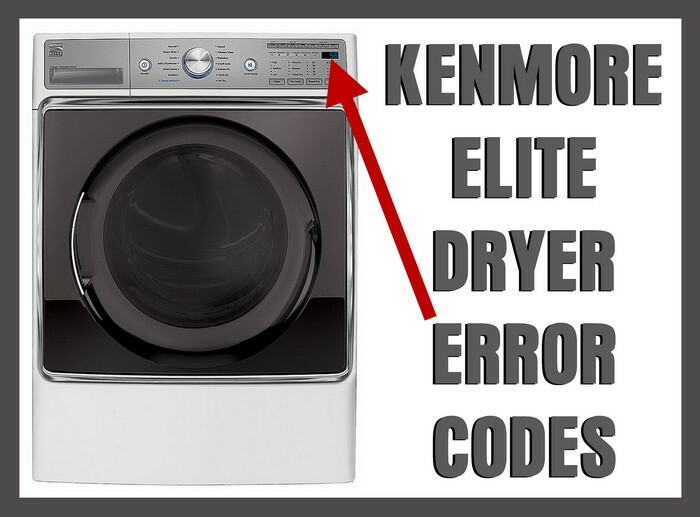 If your Kenmore Elite Dryer error code is not listed here or you have issues with any Kenmore Elite Dryer Error Code, please leave a comment below and we will be happy to assist you with your dryer error code problem. If you have any other misc questions about your Kenmore Dryer, you can ask questions about that specific model dryer and we can further assist. My Kenmore Elite dyer keeps stopping and code SRV CLL comes up. I have never had trouble with my dryer up until a week ago. I have just been having it for 4 years now. Can you please tell me what this means. All Sears stores are closed out now so what is next? My Kenmore clothes dryer is flashing CL and will not turn on. What to do? I had a F25 and F28 code on my dryer. I ordered the parts for the faults and removed and replaced them. Then cleaned the whole unit including the duct routed though the house. The unit works fine , all test work as instructed by manual. The problem is I cant get the codes to erase or reset. I figure if the parts and circuit including testing properly,that the codes would be removed by themselves. Is there a series of buttons to press to reset like there is to find faults? kenmore elite with error codes SRU and CLL model 4178110 Where do i fine the meaning of these codes? Error code is dr on my kenmore elite front load dryer. I have the same problem. If you find out can you please let me know. Bought a new washer and dryer , on 06/06/2017 the day sears delivered it my wife washed a batch of towels and tryed using the dryer and it would stay on for 10 minutes and turn off with a error code np?? They are Kenmore elite set. When the delivery guys installed the units they tryed three diffrent power cords? Its a electric dryer. I have a problem with my Kenmore Elite He5 gas dryer. It was operating in the Wrinkle Guard mode but quit displaying a PF70 code. It would not turn on, off, or do anything ecxept display the PF70. I unplugged it and allowed it to sit for awhile before plugging it back in. Now it will not turn on at all only beeping when you attempt to do so. I have a Kenmore elite oasis 110.67062600 that runs for a few seconds then shuts off showing a “F” reading . There’s no numbers after the F, I tried turning the power off for 30 seconds and hitting the cancle/stop button twice but nothings happening. I don’t want to change out a punch of unnecessary parts. What might be my problem. Thanks..
We’ve had our Kenmore 700 series gas dryer for just a little more than a year. It now has no heat. We have checkes the thermostat, the ignitor, the breaker, the gas valve, the thermal fuse and also replaced the the coil. There is no lint or a clog in the dryer or the venting. But still no heat. What more could it be? We should not be having this problem with such a new dryer. I haven’t found yet what they mean but the dryer keeps shutting off after running for 2minutes. My Kenmore Elite HE3 smartheat SteamCare Quiet Pak4 dryer kept flashing the sensing/revising estimated time yellow light when I pushed start yesterday. I was able to figure out it was F30 code and that it is an airflow restriction. I cleaned the inside of lint trap area, exhaust tube and cleaned the area from inside to outside of exhaust system. My question is, how do I reset my dryer?? I already had it unplugged for an extended time, and turned the breaker off and on to the dryer. Do you know the solution to this problem? Any help would be greatly appreciated! You cleaned all areas where airflow restriction could occur including where the exhaust tube attached to the wall? Be sure the wall opening where the dryer exhaust vents out the heat is cleaned out thoroughly also. You may have heavy lint built up in the wall in the duct leading outside. When you unplugged the dryer, did the SAME EXACT issue occur or was there a variation? If you keep receiving the F30 error code, let us know and we can go from there.